Belleek ornament is crafted of fine china and features an embossed holly wreath along with a Christmas tree in the center. The Belleek ornament is crafted of fine china and features an embossed holly wreath along the border and a Christmas tree with hand-painted accenting. The dimensional Belleek Christmas ornament is enhanced with a hand-painted green shamrock on the reverse side. 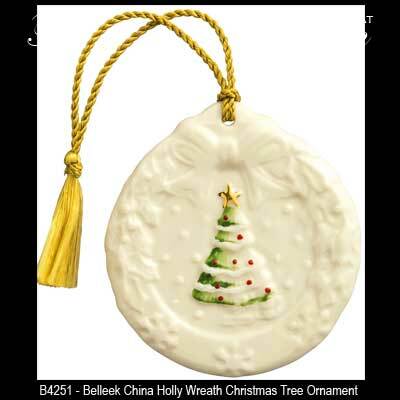 The Belleek Ireland ornament measures 3" diameter; it is ready to hang on your tree with the included gold tassel. Part of the Frost and Flake Collection, influenced by the wonderful poetry of Robert Flake and the ornate designs found in snowflakes. Story card included. Belleek ornament is crafted of fine china and features an embossed church along with snowflakes.